← 2 Styles of USB Cufflinks – One Set ACTUALLY Works! The ChargeCard Pocket iPhone Charger started out as a Kickstarter project. After having received more than enough funds to push the concept, makers Noah Dentzel and Adam Miller have now made ChargeCard into a reality. The ChargeCard is simple in its design and functions. At its essence, the device is an iPhone charging cable that folds into itself. 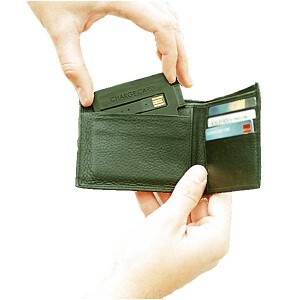 It does so compactly enough for you to fit it comfortably into your wallet. It’s not as thin as credit card, but that’s for the best, considering that this is a charger we’re talking about. It made it! From Kickstarter to production and distribution! ChargeCard USB Drive, which we wrote about last year, is here. And it’s available for iPhones AND MicroUSB! Mobile phones today do so much more than just call and text. With this multi-functionality comes unfortunately limited battery power. While it’s easy enough to bring a regular AC outlet charger with you, you still have to deal with cables that can’t resist getting tangled. With the ChargeCard (made for iPhones still on the 30-pin dock connector configuration), emergency charging is as convenient as taking out a credit card-sized charger from your wallet and connecting to a USB port. To reach such a compact form factor, the ChargeCard is made out of ABS plastic, the same type used to manufacture Lego pieces. If you’ve ever stepped on a Lego with your bare feet before, then you know from experience that it can withstand a fair amount of pressure. The iPhone charger works when you unfold the tiny rubberized arm in its center. This arm is what you’ll be connecting to a USB port. On the other edge of the card is the port that fits into your iPhone’s 30-pin connector dock. So, plug in the arm to your USB port and connect the opposite edge to your iPhone, and voila, you’re charging! Unfortunately, the ChargeCard has limited availability. If you’re a trendy owner of the new iPhone 5 (which has gotten rid of the old 30-pin connector in exchange for the Lightning one), you’ll have to wait for a compatible version to come out sometime this May. If you’re an Android phone user, then you’ve got no problem with waiting, since a USB version of the ChargeCard is also available. One unit runs for $25, and you have the option of getting a charger in black, white, or a blue/brown colorway. This entry was posted in ChargeCard, USB Charger and tagged chargecard, iphone charger, Kickstarter, usb card charger, usb charging gadget. Bookmark the permalink.